The Christmas holiday is just around the corner, and Black Friday (err Thursday, for those that went last night) begins today. That said, it’s time to begin holiday shopping ~ if you have not already done so. To inspire your shopping, each day between now and Christmas Eve, I will be posting a gift idea. Some will require an online purchase, others an in store visit, but all will reflect my tastes. Today’s find is from Pinch Provisions. 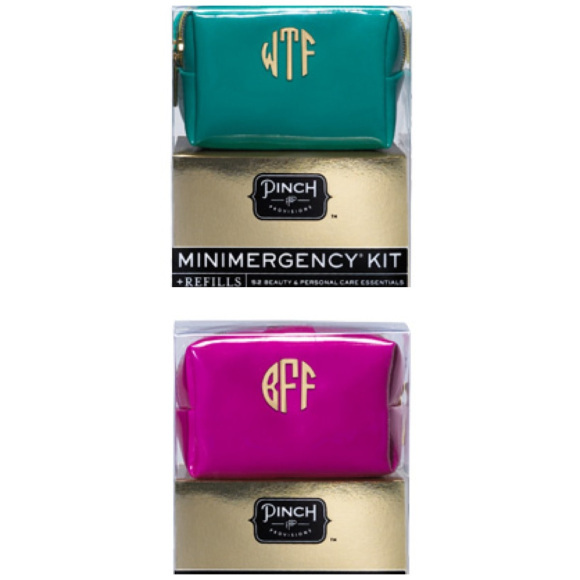 Every Doll has been out for the evening and experienced a minor “wardrobe malfunction.” These emergency kits by Pinch Provisions have all the necessary accouterments for the Doll in need. And what’s better, they are monogrammed, so that you can personalize them for your girlfriends and family members. Over the next 32 days, stop by Pretty Domestic, and share your holiday shopping finds!